The DYNAMINI hot melt adhesive supply unit is an easy-to-use, all-icon control panel and is internationally operator friendly. 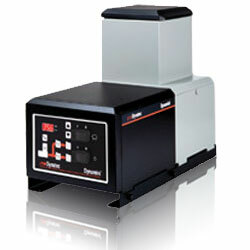 The Dynamini features ITW Dynatec's patented no-char Melt-On-Demand System. The DYNAMINI™ hot melt adhesive supply units provide exceptional value in a small hot melt unit which has been designed for optimal performance, reliability and simplified daily operation. The patented melt-on-demand hopper with 7 year warranty standard, virtually eliminates adhesive degradation. The Dynamini system provides accurate, proportionate temperature control for the hopper, hoses and applicators. Sequential start-up delays may be programmed for turn-on of the hoses and heads. The temperature control can interlock the parent machine with preselected adhesive temperatures so that production automatically begins when adhesive temperatures are correct for the application. All system temperature values can easily and quickly be programmed.